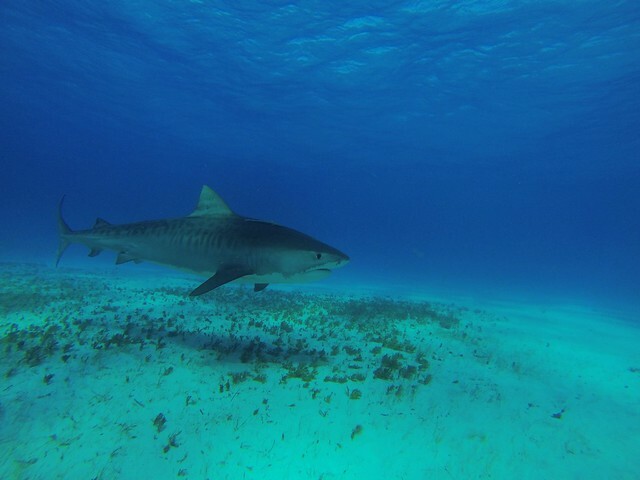 I was lukcy to dive with these sharks in the best place you can imagine, famous Tiger beach, Bahamas. This was my first “serious” shark dive. Fairly speaking, first time it was scary. But after a short time it became so much fun and I became a shark friend. Tiger sharks are wide spread in tropical and equatorial waters around the world. This guys grow up to 4-4.5 meters and weight from 400 to 650 kilos. Tigers eat literally everything they can grab – fish, invertebrates, turtle, birds, mammals and even smaller tiger sharks. Tiger sharks are massive and slow moving. They swim smoothly, like enormous airships, circling around feeder and other divers. Strenght and speed are hidden under their slowness. When shark makes an attempt to grab the chum or the feeder, it moves very rapidly. I’ve noticed how the group instinct works on people – those who were diving with tigers the first time, including myself, were constantly trying to move closer to each other and to protect their back, quite the same as sardines or herring which noticed a predator. Sharks come close, and you need to make a barrier between yourself and shark. That time I was a happy guy and haven’t used a DLSR camera underwater, so I had to protect myself with a plastic stick. When shark comes close, it closes the eyes.I suppose it’s made to protect the eyes. The guys who work in Tiger beach behave with tiger sharks as if they were pets – playing with them, scratching bellys, grabbing noses etc. At first it looks insane, but then you realise it’s just okay. Sometimes shark makes an attempt to attack feeder, but those guys are well-prepaired and don’t have any accidents. Fairly speaking, all guys who involved in shark diving industry are cool guys and great divers. And they never have serious accidents with the sharks. 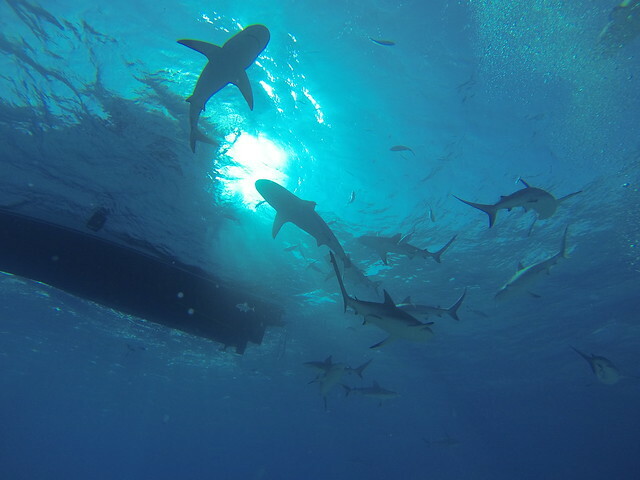 There are also carribean reef sharks and lemon sharks feeding around in Tiger beach. Once a great hammerhead came to us, but it’s shy species and usually afraid of tigers so we saw it just for a couple of seconds.